Today was a long day in the bone marrow unit but she did have a great set of nurses taking care of her. We stopped by clinic prior to bone marrow to get accessed since she was nervous about getting accessed by someone else! The day went pretty well, she had counts down and everything is dropping. Platelets and hemoglobin dropping so she will definitely be going back tomorrow to get platelets and possibly red blood depending on how she is feeling or if drops anymore. Over the stem cell infusion went great, no problems or issues. Blood pressure remained on the lower side with heart rate being up. We are not sure why the heart rate is up but dr gowda said we could check her heart next week by doing a scan of some sort if it is still up. 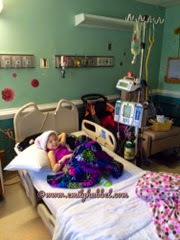 She had 4 hours of fluids after the stem cells. Tonight she is doing well, she seems tired after a long day and agitated but we are home and for that she is happy! Thank you for continuing to keep Emily in your thoughts!